I’m a big fan of cheap and easy… I’m referring to my crafts. =] So, it seems wreaths are a big decor choice, and why not? They are easy, pretty, personalizable, customizable, the possibilities are endless and they are easy to change up. Awesome, right? I’ve seen the fabric wreaths, the yarn ball wreaths, the jingle bell wreaths, the ball ornament wreaths, and on and on. But, I didn’t even have time for that! I know, crazy, right. Ahh, welcome to my life. So, here’s is my super simple, super quick Christmas wreath. 1) Take a trip to the Dollar Store. Grab yourself a pine garland in their Christmas section. It’s 15 feet long. 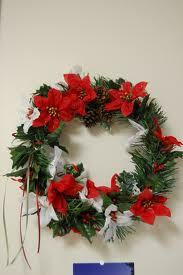 That’s right, you’ll get more than one wreath out of this puppy. Also grab a poinsetta garland. One of two. I did one for each wreath (made two). 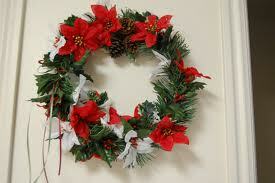 I got one red poinsetta garland and a white one. 2) At home, I pulled every other flower off the garland and switched them to the other garland. This way both my garlands had both red and white flowers on them. Take the pine garland and trim it down to the length you want. I actually cut it in half and then double wrapped it, so it would be fuller. Then take the two garlands and twist them together. Secure the ends with a few twists or make a hook and loop closure. 3) Hang it up. Not kidding, you’re done! I think I spent more time standing in line at the store than I did putting this together. Now it’s now the prettiest wreath or anything, but it’s festive and totally works in a pinch. And you spend a whole $3! Sorry for the lack of “How To” pictures… this was pre-blog. But it’s pretty simple. If you do have questions, please ask! Well and beautifully done and notalotta money! Love that! Kudos on your creative thinking you clever woman. Awesome job! Gotta love the dollar store!